Fine china manufacturers G-M (alphabetical listings). This is page 2 of 3 of Peter Holland's "Who's Who" of famous china makers within Western culture. Dates, facts and the story of the people behind the brands. Fine china manufacturers G-M (alphabetical listings) begins here . . . The first Russian Porcelain maker, founded by Englishman Francis Gardner in 1766. They produced high quality wares and figures. It remained in the Gardner family until 1891, when it was purchased by Dulevo Porcelain. Dulevo was also known as Kusnetzoff (or Kuznetsov) - named after the founder Yaakov Kuznetsov. - Verbilki or Verbilky ('Вербилки' in Russian). The moose marks shown in the photos are those sent in by site visitors. 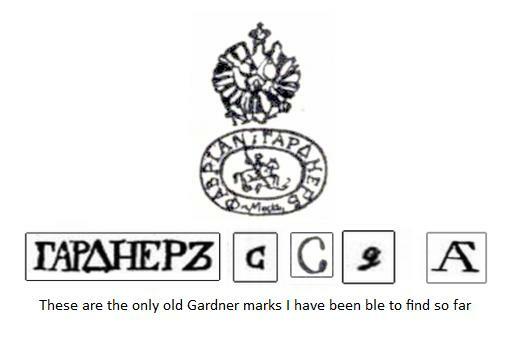 They do not represent a catalogue of all Gardner marks which seem quite hard to research online. Kusnetzoff still make Gardner wares today. In general, the early work, particularly in the late 18th century, is very highly thought of in collector circles - being regarded as highly as eary Meissen. Much to the annoyance of the Imperial Porcelain Factory, in the 18th century, they were commissioned to supply the Royal Family. This was all prior to the Kusnetzoff takeover. After 1891, the production values were less stringent and therefore wares not as well regarded. Gien is a quality china manufacturer that specializes in earthenware. Founded in 1821 by Thomas Hall who was an Englishman with a mission to introduce fine English earthenware techniques to France, the home of hard-paste porcelain. Gien presented exceptional earthenware exhibitions pieces from 1855 to 1900. In the 20th Century, despite wars and other crisis, Gien is the no. 1 producer of quality earthenware in France, and one of the best selling brands worldwide. See also Limoges (below). The Goebel company are recorded by Kovels to have begun in 1871. However, I read somewhere (can't remember where) that Goebel kilns were first purchased in 1879 and prior to that, they weren't making ceramics. Further research needed on that point (I tend not to look at company websites or ask companies direct as they can be full of marketing talk). Obviously they are known for Hummel figurines (see separate listing below), but remember, they didn't strike up a deal with Sister Hummel (a well known illustrator until 1935) - quite well into their history. In terms if trademarks and backstamps, there can also be some confusion about the markings of the Goebel company. The TMK-1 or "Crown-WG" mark is the wide Ducal crown which replaced the narrow Ducal crown in 1923. For another 12 years after this, remember there were still no Hummel figurines, only Goebel branded work. Hummel collectors often incorrectly state (especially on ebay) the TMK-1 mark was first seen at the Leipzig Fair along with the first Hummels launch. However, this is incorrect because pre-Hummel figurines carried the TMK-1 mark from 1923. The first Hummel bee mark was used from 1950 and some sellers, particularly on eBay, mistakenly refer to this mark as TMK-1. The correct assignation is TMK-2 for the first Hummel fat Bumble Bee mark. The TMK-1 crown is more normally found on dolls as well as figurines especially with a religious subject matter. The TMK-1 incised Crown trademark is rare and the quality of some pieces can be exceptional in terms of both sculpt and make. I have seen some glazed examples where both the glazing and quality of sculpt is beautiful quality. However, most collectors are interested in the Goebel company because of their un-glazed Hummel range of children figurines based on the artwork of Maria Hummel, which began in 1935, and so may not be so interested in these early pre-Hummel pieces. Gorham was founded in 1831 in California, USA by Jabez Gorham. Initially, Gorham manufactured only eathenware. 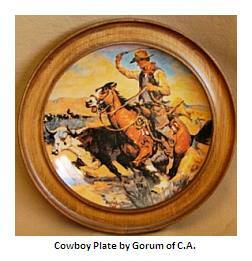 In 1970 Gorham purchased the Flintridge China Company and in Pasadena, California began to make fine china dinnerware. Gorham also began producing their own china designs many of which were made to coordinate with their sterling silver patterns. In 1984, Gorham ceased manufacturing its own china and began importing it from Japan. 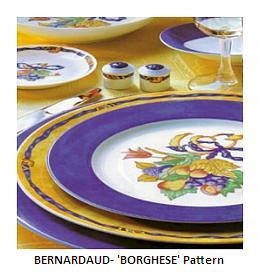 In the early 1990s, Lenox (see below) purchased Gorham and continues to make various Gorham China patterns today. Grafton bone china or "Royal Grafton" as it more commonly known now, is a pottery mark of antique bone china manufacturer, A.B. Jones & Sons Ltd see listed here:- Royal Grafton bone china OR go to the Antique bone china manufacturers section and look under "R". Haviland porcelain has its own dedicated information page - see Haviland Dinnerware. See also Limoges (below). (also made Sutherland and Delphine Ware) see antique bone china section. 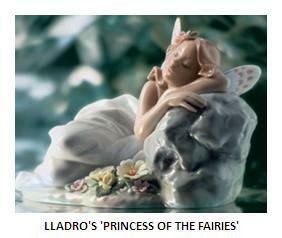 Beautiful figurines are one of the things the Hutschenreuther porcelain company are famous for. Founded in 1814 by Carolus Magnus Hutschenreuther in Hohenberg an der Eger, Bavaria, Germany. Hutschenreuther acquired sculptors and skilled labourers then began working with the Selb Technical School of Porcelain. Selb is also the home of Rosenthal. Today, Hutschenreuther is part of the Rosenthal Group, who, in turn have been acquired by the Wedgwood group. 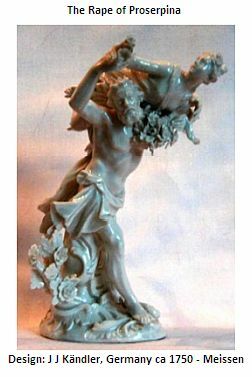 Hummel figurines are a product of the Goebel company (est. 1871) is written about above in the Goebel listing. This entry is more specifically about the Hummel figurines, launched in 1935. Sister Maria Innocentia Hummel was an artist and illustrator mainly portraying children. The items made today are still under the quality control supervision of the Sisters of the Convent of Siessen. Born in 1909 as Berta Hummel in Bavaria, Berta received formal artistic training and went on to join the convent, helping to support it with her artistic endeavours. It is reported the life-changing partnership began when Franz Goebel apparently spotted the artwork whilst browsing in a shop and the figurines were launched at the 1935 Leipzig Spring Fair to great success. 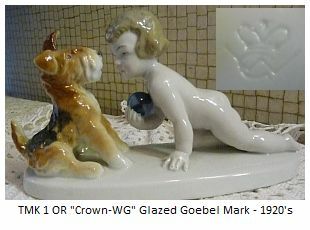 The war was a disaster for much of the German ceramics industry, but not so Goebel because American soldiers particularly took to the figurines, and the rest is history. 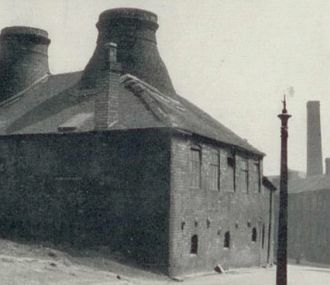 Jackfield in Shrophire, not far from the site of the original Coalport works, was long known as a centre of the early pottery industry, and had developed its own distinctive style of pottery manufacture by the early 1700’s - black Jackfield glaze . Not a factory but a type of pottery ‘Jackfield Black’. 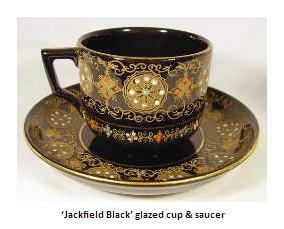 Jackfield ware would have competed against majolica for the Victorian table. Johnson Bros see the Johnson Brothers China page. see under "B" for Berlin above. Limoges is a region of china manufacturers in France, not a company (just like Staffordshire in the UK, or Dresden in Germany, or East Liverpool in the US). Kaolin was discovered in c.1760, close to Limoges and gave rise to the industry. See the porcelain china section for more information. The first porcelain factory in Limoges was in 1765. Within a few years, the Limoges porcelain became a branch of the royal manufacturer at Sevres producing porcelain blanks for final decoration at Sevres (for more information on Sevres see listed under "S" below). Collectors also seem to like to seek out Limoges trinket boxes. Names of makers include Artoria, Chamart, Chanille, Parry-Vieille and DuBarry. In 1953 three brothers Juan, José and Vicente Lladró made their first ceramic creations in their home in Almàssera (Valencia) Spain. They had acquired a Moorish furnace and, while their day job was at a local crockery factory, at home they developed their artistic interests. With the use of their furnace they began to produce figurines influenced by Meissen, Sèvres and Capodimonte. By 1958 they had given up the day job and moved to an old nearby warehouse. With much experimentation they developed innovative techniques such as the one-fire process which created their lovely smooth finish and pastel colour pallette. Like Franz (see above) a modern model of ingenuity, artistry and acumen. Top marks to the Lladro brothers - to thrive and succeed in a time period where so many other china manufacturers have failed. Ludwigsburg was a porcelain factory established by Herr Ringler in Ludwigsburg in 1758. It had faded out by 1824 but left a glorious trail. In 1947 the factory was revived and still manufactures to this day. The town was also known as Kronenburg (Crown-town), referring to the burg or town of the Duke. In some references the name of Louisburg is also mentioned, simply because Louis is the English translation of the name Ludwig and 'burg' simply means 'town'. The Louisburg porcelain mark was used between 1806 and 1816. Wurtenburg refers to the coat of arms of Wurtenburg - the 3 'stag antlers' later used by the Ludswigburg factory (also incidentally the same motive as used on the badge of the famous Porsche sports cars). The patron of the factory was Duke Charles Eugene, but the site of choice was a bad one because of the lack of readily available clay and fuel which had to be imported from quite some distance at great expense. The early clay body is characterized by a grey colour and coarse texture. However, the sculptural beauty of the early work is almost unsurpassed in the history of the ceramics industry. They were known for the fineness of their figural groups and very fine painting. The earliest mark was the C in reversed ciphers, later to be copied by the leading English firms like Crown Staffordshire. The crown of the Duke was added later (sometimes referred to as the Ducal Crown). Different styles of crown were used at different times. The reversed 'C' cyphers were replaced in 1806 with the letters TR beneath the crown (looks either like an odd shaped cursive R rather than a T.R. or otherwise the cursive T could be mistaken for a J R). In 1818 they started to use the letters W.R. under the crown. Occasionally, the heraldry of the Wurtenburg arms were used - the three stag horns (exactly the same as later used by motor car manufacturers Porsche). The stag antlers were used both with and without the letter L. Later a single antler was used. So how can you tell of you have a priceless figural Ludwigsburg ceramic sculpture, or you have a rip-off with a copy-cat pottery mark? Apart from the the obvious coarse grayness of the clay body, the exquisite early sculpture shows an immaculate attention to detail. For example, look for the signs of detail so precise you can see fingernails. For example, on the detail above above you can see the care and skill taken in the sculpting. Being a professional sculptor myself, I know how difficult achieving this type of detail is. Sculpting fingernails is one thing, but to have a factory skilled enough to reproduce the fingernail detail within the rigors of a production run is quite another thing. Look also with early Ludwigsburg at the fantastically fine painting skills. Sometimes just to look at something carefully is enough to become aware of the production values on display - so the biggest tip is to simply open your eyes. porcelainmarksandmore.com have a very comprehensive guide to Ludwigsburg, in fact the best I have seen online. There is also a very good a book first published in the late 1800 called Pottery and Porcelain: A Guide to Collectors By Frederick Litchfield which also has a good section on Ludwigsburg. Hopefully, this listing will be enough for you to know what you might or might not have in front of you. Founded by James Meakin in 1845, Staffordshire, England, Meakins were predominantly earthenware manufacturers of domestic tableware. They were not luxury producers, but set their stall out to be utilitarian makers of strong durable products. Meakin had three sons. James and George took over the business in 1852 when their father died (the firm was renamed J & G Meakin). Johnson Brothers (click here for more information) and were most known for producing tea-leaf design for the export market. In the 19th century the J & G Meakin was well-known for its white granite (undecorated ironstone) – a take on European, particularly French porcelain of the period. Prior to 1945 they specialized in competitively priced export tablewares, particularly for the American market, and South America. A family off-shoot resulted in the formation of Johnson Brothers Johnson Brothers China. By the 1950s about 80% of production was for export markets which by now also included Australia, New Zealand, the Far East and Scandinavia. During the 20th century the firm was known for its "Sol" wares produced between 1912 and 1963 for both home and hotel use. To give an idea of the size of the firm, in the early 50’s around a million pieces of Sol were manufactured per week. Post war expansion in the home market for domestic tableware resulted in a wide range of traditional and fashionable shapes and patterns being produced between the boom years of 1945-1975. For example, there was the Habitant Studio Ware in raspberry red, daffodil yellow, bottle green and grey. Meakins merged with Midwinters in 1968. Midwinter, a now defunct name (see below) has subsequently become very collectible. Midwinter had bought A J Wilkinsons in the mid 60's - the firm often using the trade name 'Royal Staffordshire' and inexorably linked with Clarice Cliff - see listed under 'R' below. In 1970 Midwinter/Meakin were taken over by Wedgwood Group and corralled into their 'Creative Tableware' stable. See also 'Dresden' listing above under 'D'. The earliest deposits of the mineral required to make porcelain were discovered near Meissen, Germany during the 1600’s. With the skill of alchemist Johann Friedrich Böttger, Meissen won the race to emulate Chinese hard-paste or ‘real’ porcelain in 1710. The artistry of Johann Kandler, employed at the factory from 1731, enabled Meissen to take advantage of their discovery. 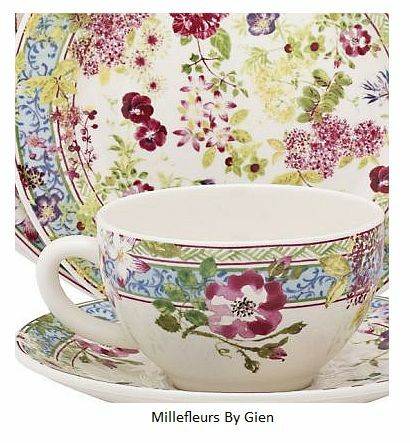 Meissen still produce today, for example the stunning and original White Waves tableware. 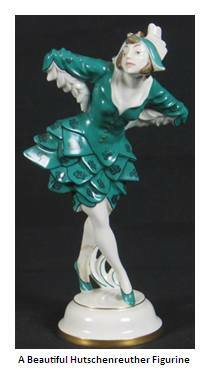 It strikes me as a blessing, particularly considering the devastation wreaked on Dresden during WW11, that the originators of European Porcelain, and makers of stunning figurines like the figure of the girl shown opposite (made nearly 200 years ago), are still able to show such fine china to the world. Midwinter Pottery - founded 1910 in Burslem , Stoke-on-Trent, Staffordshire by the Midwinter family. By the 1930's it had become one of the leading of the pottery firms employing nearly 800 staff. The 1950's was their design heyday under the stewardship of Roy Midwinter. Roy had gone to the US and been influenced by the contemporary designs shown in the collections of firms such as Franciscan Pottery under the brilliant leadership of Frederic and Mary Grant. It must have made him think "We can do that too" (see Franciscan Pottery page). The Festival of Britain in 1951 had originally set the contemporary UK design scene which Midwinter then took the lead in implementing into industrial ceramic design. The secret was to use the services of talented young designers. One such designer went on to become an iconic leader of British and European design - Terence Conran, no less. Conran went onto open his own shops and national retail chain, Habitat. The 'Spanish Garden design' was one of Midwinter's most successful designs. It was also integrated into kitchen items such as chopping boards and bread bins. Midwinter were rocked in the late 1960's when a major new collection was shunned by buyers. To add insult to injury, the company was weakened further by a second unsuccessful range shortly after. A merger with J. & G. Meakin ensued in 1968. Two years later Meakins itself was taken over by the Wedgwood Group. Midwinter kept producing wares under their own name and from their own factory until 1987. Midwinter is now a highly collectible pottery. They were committed to design innovation, something they kept to for more than 30 years. You may see the Midwinter name associated with the Clarice Cliff name. This came about because of a merger with A. J. Wilkinson (aka 'Royal Staffordshire' - see under 'R' below) in 1964. Wilkinson was the firm that Clarice Cliff was associated with for many years and the maker of her wares. 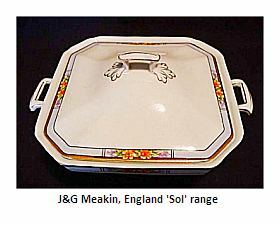 They then merged with 'Sol' makers J & G Meakin in 1968. 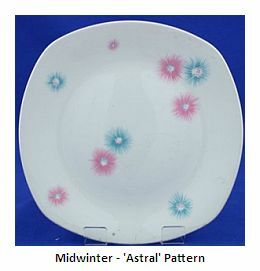 The 'Astral' pattern shown above seems to be influenced by American firm Franciscan 1950's 'Starburst' pattern. See Franciscan Pottery. see Minton Bone China page. See the Moorcroft Vases section of this site.